Following the public outrage surrounding the Egyptian government’s decision to cede two strategic Red Sea islands to Saudi Arabia, President Abdel Fattah Al-Sisi responded to the criticism in a speech on Wednesday, saying the move was supported by state documents. 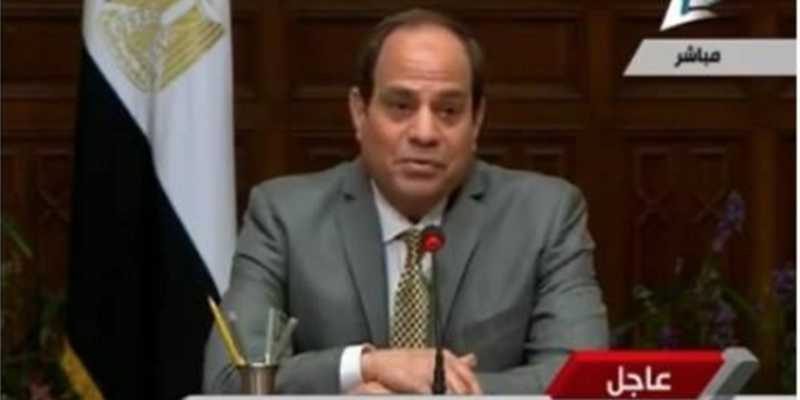 “The decision [to acknowledge the Saudi claim] was made through documents with the Egyptian state institutions such as the Ministry of Foreign Affairs, the Ministry of Defence and the General Intelligence Service; we also stuck to the 1990 presidential decree which was submitted to the United Nations,” Al-Sisi said in a televised meeting attended by state officials and public figures. He pointed out that it is important to acknowledge the difference between personal opinions and decisions taken by the state. “The controversy is caused by the difference between how the state deals with the issue and how people take it from an individual perspective,” he said. The president went on to say that he began studying the issue of redrawing maritime borders with Saudi Arabia in June 2014, the same month he assumed the post of president. Following his speech, many Egyptians took to Twitter to further criticize the president and the top-trending hashtag on the social media platform became #Leave (#ارحل). #Sisi just delivered a Morsi quality rambling & condescending speech at a time in which his govt is under public attack over the islands. Last week the Egyptian cabinet announced that it was recognizing the two islands of Sanafir and Tiran as Saudi sovereign territory, following six years of discussions with Saudi Arabia. The cabinet statement said that the delimitation of the maritime borders relied on a 1990 presidential decree outlining Egypt’s basis of outlining territorial seas, which Egypt notified the United Nations of in May of 1990, in addition to discussions between Egypt and Saudi Arabia during the same year and Saudi Arabia’s basis of outlining territorial seas. The cabinet’s official think-tank, the Information and Decision Support Centrer, has also responded to the controversy regarding the two islands. “The parliament has the full freedom to vote for or against the agreement, as the president won’t ratify it except after the parliament approves it, and it is not applicable except after ratification,” a statement published by the think-tank read, according to state media. The think-tank defended the government’s position by referring to official documents that allegedly prove that the islands falls under Saudi sovereignty. The documents included the above-mentioned 1990 presidential decree stating that the islands’ territory is outside Egyptian territory, correspondence between the Egyptian Ministry of Foreign Affairs and its Saudi counterpart in 1988 and 1989, in addition to a map produced by the United Nations from 1973. The cabinet also cited a letter from the US ambassador in Cairo to the American Secretary of State from 1950 stating that the islands are Saudi. The response by the president and the cabinet comes amid heated public discussion where public figures, social media users and the general public have been locked into a debate about whether or not the islands are Egyptian. The president has been criticized on social media for “selling” the islands in exchange for increased Saudi investments in Egypt and financial support.